I took another shot at riding Wizard, and put him on the longe line before I rode. Same as all the other rides… looks okay on the longe, is okay on a loose rein with no leg, but gets all riled up when I give him leg or rein contact. Ears pinned, kicking toward the girth with his hind legs, and swishing tail. He’s been on the omeprazole for over 20 days, and I’ve seen no difference. Next step is a visit from the farrier (he’ll be at 6 weeks at the beginning of Nov) and a visit from the vet. At night, on my birthday, before my hot date with Mr. Andrew, I longed Wizard outdoors. He did some leaping around when I first asked for a canter, but was otherwise perfectly behaved. He worked in his surcingle, without side reins during warmup and cooldown, and with them for about 10 minutes. I longed Wizard at night again, in the indoor arena. He worked with his saddle on, and I had a quarter sheet on him to keep his muscles warmed up. The air is CHILLY, after a weekend featuring snow, and two nights of temperatures close to freezing. Wizard did the same little leap when I asked him for a canter, but then picked up his lead perfectly. 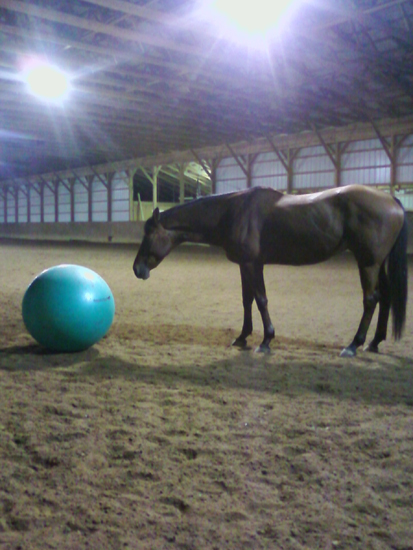 I only asked for a few rotations at the canter, since I don’t want to stress his joints on a circle. He longed in side reins for about 10 minutes, and the rest of the time during his warmup and cooldown, he did not have his side reins on.